Order Your Own IceHL Jersey! Just wanted to update everybody on the IceHL jersey contest. The Milwaukee Lagers sweater is now available for you to own and wear from RinkGear! Be sure to order yours right away. If they sell enough Lagers jerseys, they'll consider making more IceHL sweaters! Also wanted to update the GMs and AGMs. 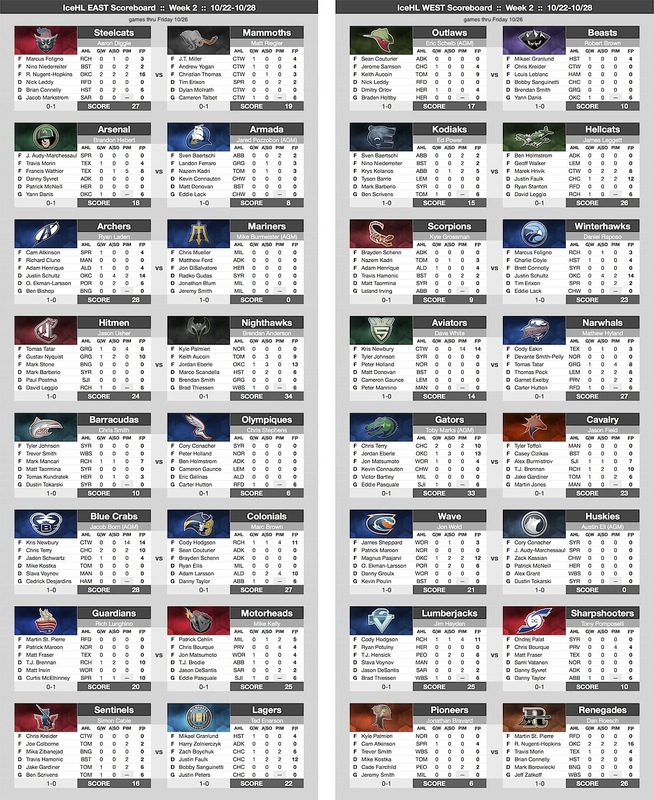 Since I won't be able to update the leagu scoreboards on Monday as I normally would (taking a long weekend), I've posted a mid-week update as of Friday's AHL games. Couple of notes. There are actually two teams with no points at this stage of the week. The Mariners are getting shut out 28-0 by the Archers in the IceHL EAST. In the IceHL WEST, the Huskies are down 21-0 to the Wave. Also, if you have any Oklahoma City Barons players on your team, you're probably killing it right now. Ryan Nugent-Hopkins has 16 points, Justin Schultz has 14 points and Jordan Eberle has 13, to name a few. Check back on Tuesday to see the final results from Week 2. By the way, because there are no AHL games on Monday or Tuesday of next week, I'm giving everybody an extra day to submit waiver claim requests. The Week 3 deadline is now Tuesday at 3pm ET. Don't delay. The earlier you submit your claim, the better. One more note. We have a newcomer! Tony Krogen is taking over AGM duties for the Olympiques as of Week 3. Chris Stephens will remain GM of the franchise.